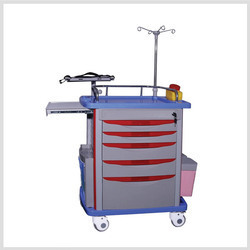 Our range of products include medical crash cart. We are the leading importers of Emergency Crash Carts. High-quality ABS Body with raised edge design. High quality Scratch-proof Aluminum Columns for extra strength. 5 Drawers with Flexible & adjustable Inner partitions. 1 Defibrillator Shelf & 1 Extra Sliding Side Shelf. 1 CPR Board, Oxygen Cylinder Holder. 1 IV Pole, 1 Utility Container, 1 Sharp Container, 2 Dust Bins.